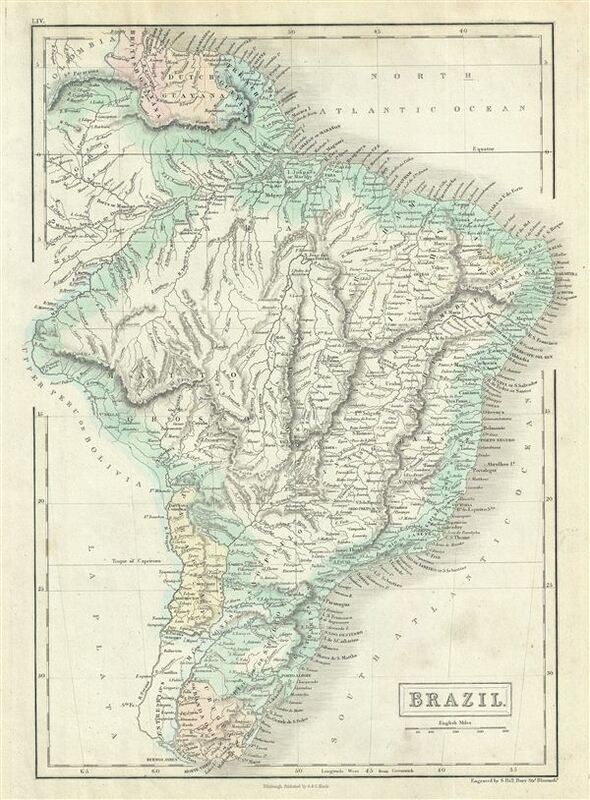 This is a fine example of Adam and Charles Black's 1851 map of Brazil. It covers the South American countries of Brazil, Uruguay, Paraguay and Guyana. Under emperor Dom Pedro I Brazil had declared itself indecent of Portugal roughly 29 turbulent years earlier. As this map was being drawn, Brazil found itself enmeshed in the Platine War. Also known as the 'War Against Oribe and Rosas,' the Platine War was fought between Argentina and the alliance of the empire of Brazil, Uruguay and some Argentine provinces for influence over Uruguay and Paraguay. Various towns, cities, rivers, mountains and several other topographical details are noted with relief shown by hachure. This map was engraved by Sidney Hall and issued as plate no. LIV in the 1851 edition of Black's General Atlas of the World. Rumsey 2305.064 (1854 edition). Philips (atlases) 4334.